R. A. Gallardo – Corresponding author; Department of Population Health and Reproduction, School of Veterinary Medicine, University of California, Davis. - A. P. da Silva – Department of Population Health and Reproduction, School of Veterinary Medicine, University of California, Davis. - R. Hauck – Department of Pathobiology, College of Veterinary Medicine, Auburn University. - H. Zhou – College of Agriculture, Department of Animal Sciences, University of California, Davis. 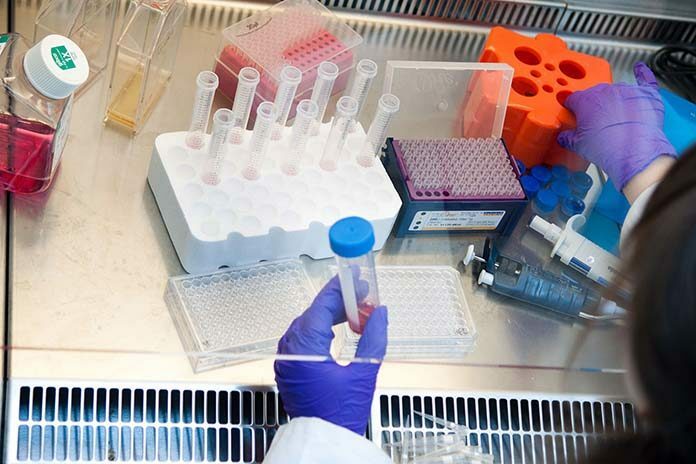 In previous experiments, we have challenged major histocompatibility complex (MHC) congenic chicken lines available at UC Davis with an infectious bronchitis virus (IBV) M41 strain to assess resistance to IBV infection. We assessed clinical signs, tracheal thickness, viral load in tears and IgG and IgA levels in tears and sera and demonstrated that MHC haplotypes B2 and B19 were relatively the most resistant and susceptible respectively to an IBV challenge. The major differences between the two MHC haplotypes were found in viral load in tears at two dpi and in humoral responses at 14 dpi. In the present experiment, we used the resistant B2 and the susceptible B19 haplotype chickens to compare clinical, pathological and immunological differences between the two chicken lines after challenge with two different IBV genotypes, M41 and Arkansas Delmarva Poultry Industry (ArkDPI). We assessed respiratory signs, tracheal thickness, viral load in tears and IFN-β, IFN-γ, IgG and IgA levels in sera and tears. We also collected Harderian glands, CALT and tracheas at two and six dpi to perform RNA sequencing and investigate immune pathways that could be associated with the different levels of resistance in the two distinct MHC chicken lines. B2 haplotype chickens presented milder clinical signs, less tracheal inflammation and higher antibody production compared to B19 haplotype chickens in both viral challenges. These results support the evidence of B2 and B19 being resistant and susceptible respectively to IBV M41 and also to IBV ArkDPI. Cytokine assessments were unclear and further research is being performed to investigate the role of innate immune responses in resistance to IBV in these MHC congenic chicken lines. Infectious bronchitis (IB) is characterized by an upper respiratory, urogenital and reproductive illness in chickens. IBV is known for its genetic variability and phenotypic diversity. It is common to encounter new IBV genotypes able to successfully circumvent vaccination programs used in the poultry industry (10). The chicken MHC is small and single dominantly expressed (8), showing strong association with protection or vulnerability to several infectious diseases (1, 4, 5), including Infectious Bronchitis (2, 3, 6). Understanding the mechanisms underlying resistance is essential to craft novel prevention strategies to Infectious Bronchitis by stimulating components of the immune system that are not being stimulated by ordinarily used vaccines. In previous experiments, we have demonstrated that MHC haplotype B2 chickens were relatively resistant and that MHC haplotype B19 chickens were relatively susceptible to our challenge with IBV Massachusetts 41 (M41). The major differences between the two MHC haplotypes were found in viral load in tears at 2 days post-infection (dpi) and in humoral responses at 14 dpi (6). In the present experiment, our goal was to evaluate differences in clinical signs, tracheal thickness, viral load, cytokine production and humoral responses between relatively resistant and susceptible MHC congenic chicken lines after challenges with two IBV genotypes, M41 and ArkDPI. We are currently analyzing the tracheal transcriptome to investigate immune pathways elicited in B2 and B19 haplotype chickens and the possible differences in viral microbiome composition. The relatively resistant 331/B2 and susceptible 335/B19 chicken lines were used in this experiment (6). A total of 150 chickens – 75 of each line – were divided into six groups with 25 birds each. The challenge was performed at 23 days of age with a 5×107 median embryo infectious dose (EID50) of either IBV M41 or IBV ArkDPI in a final volume of 200 μL via oculonasal route. Control groups were unchallenged. At two and six dpi, respiratory signs and viral load in tears were assessed in all birds as described previously (6). Eight birds per group were euthanized at two and six dpi and tracheas were collected to perform histomorphometrical analysis. In addition, sera and tears were collected to detect IFN-β and IFN-γ by enzyme-linked immunosorbent assay (ELISA). Harderian glands, tracheas and conjunctiva-associated lymphoid tissues (CALT) were collected to perform RNA-sequencing to explore immunological pathways that might be associated with susceptible and resistant chicken lines and to investigate their upper respiratory tract virome. At 14 dpi, sera and tears were collected from the remaining birds to assess IFN-β, IFN-γ, anti-IBV IgG and IgA levels by ELISA. Clinical signs, viral load, histomorphometry measurements, cytokine concentrations and antibody titers were analyzed individually and compared by one-way ANOVA followed by Tukey multiple comparisons test using GraphPad Prism software (GraphPad, La Jolla CA, USA). Statistical differences were considered at a significance level of p<0.05. At two dpi, there were no differences in respiratory sign indices or tracheal epithelial thicknesses between the challenged groups. At six dpi, the resistant B2 haplotype chickens presented less severe respiratory signs and less tracheal inflammation than the susceptible B19 chickens, regardless of the Infectious Bronchitis genotype (Figure 1). B2 haplotype chickens challenged with IBV ArkDPI presented the lowest viral load at two dpi. No differences between the challenged groups were detected at six dpi. It was not possible to draw conclusions about innate immune responses through our IFN-β and IFN-γ assessments in sera and tears. Some possible explanations are: (1) Inappropriate sample collection dates to assess innate immune responses; (2) Lack of environmental control which might have led to innate immunity stimulation before the Infectious Bronchitis challenge in all groups. This situation might have masked patterns or differences between the groups. Further in vivo experiments are being performed in battery cages looking for a better control of the environment. The major differences between the two chicken lines, even though non-significant, were observed in humoral immune responses. B2 haplotype chickens presented higher Infectious Bronchitis-specific IgG response in sera compared to B19 chickens at 14 dpi (Figure 2A). In order to assess local humoral responses, we assessed IgG and IgA levels in tears. IgG levels in tears were statistically higher in B2 than in B19 haplotype chickens in both viral challenges (p<0.05, Figure 2B). The high titers of local IgG is most likely due to the transport of IgG from sera and to the production of IgG by plasma cells in the Harderian glands and CALT (9). IgA results in tears were also higher in B2 haplotype chickens than in B19, especially in birds challenged with IBV M41 (p<0.05, Figure 2C). These results are of paramount importance since generation of IBV neutralizing antibodies in the primary infection site rather than systemic response alone should be the goal of IBV vaccines. Harderian glands, CALT and tracheas collected at two and six dpi are still being processed in order to assess transcriptomic changes induced by both challenges (IBV M41 and ArkDPI). We will also investigate changes in the tracheal virome from both chicken lines. 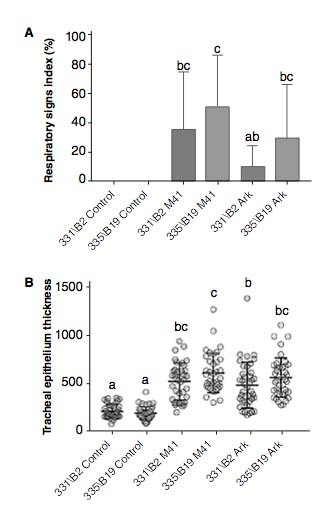 The results from this experiment suggest that 331/B2 is relatively resistant to both Infectious Bronchitis M41 and ArkDPI, validating the B2/B19 resistant-susceptible model as described by us (6) and others (3, 5, 7). Further research will be focused on investigating innate immune responses of these lines in more depth.